Our traditional willow baskets have a timeless, natural appeal. They are not only attractive, but also provide a very practical means of storage, be it in the kitchen, living room, bathroom, bedroom or play room. When we set out to source willow baskets, we were surprised to find that they are not only difficult to find, but that the quality was often lacking. We were therefore very excited to find these baskets which really are very attractive and well woven - in fact our own level of satisfaction with these products is more than matched by the steady flow of positive feedback we receive from members of the public and corporate customers who have purchased these from us. These attractive hamper baskets are hand woven from high grade, strong natural willow and have a woven carry handle and 2 x leather strap fastenings. 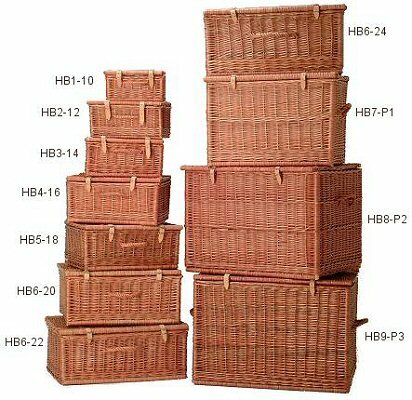 This suitcase-shape style of basket is very practical and can be used for a variety of storage purposes. These baskets can also be used to make your own gift hamper by filling it with a hand chosen selection of food items or gifts, and can also be used to make your own picnic basket.